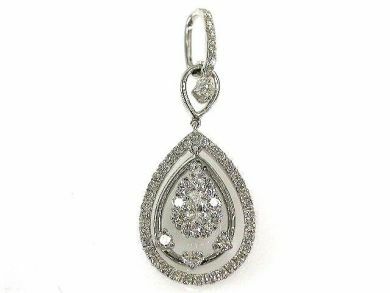 One 18 karat white gold tear drop pendant. One pear brilliant cut diamond (0.08 carats: SI1 clarity: F-G colour). Fifty-four round brilliant cut diamonds (0.62 carats: VS-SI clarity: G-H colour). One square baguette (0.06 carats: VS2 clarity: G-H colour).